The United States Mint is geared up to issue celebratory bicentennial Lincoln cents and has released 2009 Lincoln Penny images for public viewing. The coin images are timely. The first of four commemorative circulating cents will launch on Thursday, February 12, to kick-off the 200th anniversary of Abraham Lincoln’s birth. Similar to the 2009 Lincoln Silver Dollar images released last week, the new images provide a genuine sense of how the coins will look and feel up close, unlike the initial penny designs made available in September of 2008. The four new designs celebrate the bicentennial of President Abraham Lincoln’s birth, as well as the 100th anniversary of the production of the Lincoln cent. 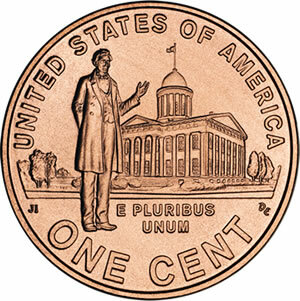 The obverse, or heads side, of the pennies bear the standard Victor David Brenner’s likeness of President Lincoln, introduced in 1909. Each reverse depicts the four major aspects of Lincoln’s life: his birth and childhood in Kentucky, his formative years in Indiana, his professional life in Illinois and his Presidency in Washington, D.C.
Depicts a log cabin that represents Lincoln’s humble beginnings in Kentucky. Depicts a young Lincoln educating himself while working as a rail splitter in Indiana. Depicts the young professional Abraham Lincoln in front of the State Capitol in Illinois. Depicts the half finished United States Capitol dome. 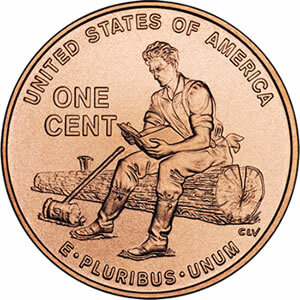 The new pennies will be issued in approximately three-month intervals throughout the year (launch dates for the latter three cents have not been officially released). Editor’s Note: For additional information, visit the CoinNews sister sites 2009 Lincoln Pennies and Lincoln Pennies. 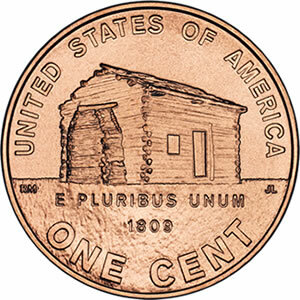 Where can I buy the new 2009 Lincoln Penny? i would like to purchas the new cents from the mint but dont see them on thier product list for release, where can i find them to buy them? i am a collector. has anyone been able to find the new cents anywere yet? I would like to buy some. (Lincoln’s Birth and Early Childhood in Kentucky). Can anyone tell me how and where? Where can I buy the new pennies? Would I need to go to the bank? or online through a special dealer? Some banks throughout the U.S. are beginning to carry the new pennies. I would suggest calling first, before stopping by to check unless you’re already at the bank for another purpose. They can be purchased on places like eBay. However, they’re going for a premium right now because they are so hard to find. You may wish to check your local coin dealers. 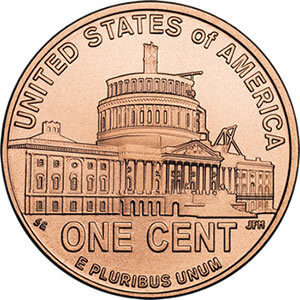 Over time, the pennies should circulate and be found in daily pocket change. That will be the cheapest place to get them! Where is “In God We Trust” on the new design? If it’s not there, I will refuse them in my change! Hey Cheryle..its on the front just like its been since 1909!!!! I received a roll of new second series Lincoln pennies in my change when I asked for them. I have not opened the roll yet, but with my magnifier I can see what looks to be “ribs” on a few of the cents, almost looking like teeth clenched together. The Penny Roll is with clear shrink wrap, and I do not know if that signifies any difference or not. Is there any way for me to find out if these are worth more than a cent or not? I have two lincoln pennies of the second series. Does anyone want to purchace them? Cheryle – please take a deep breath, relax, and don’t believe every Internet rumor you read. There’s no conspiracy. The motto’s not going anywhere. Just HOW do these things get started, anyway?? Even if you have tons (vs. “tuns”) they’d have to be uncirculated to command any significant premium. IMO though they’re difficult enough to find in change that you might be able to sell those for a small amount extra, maybe 5 or 10 cents each. If anyone thinks I’m on the low end, please shout out. I have a “Formative Years, Indiana” 2009 penny coin. How can I tell if the coin is a P, D, or an S mint? I also have a 2010 “Union” cent coin and a 1945 penny with no mint location. How can I found out where it was minted? I found the third one afew days ago I was looking threw my change when I found it I was amazed to see one. I just found one of the fourth lincoln issue pennies in my change from work. Thought it was cool so I googled it and found this site. Thanks for the information I will hold on to this as they may or may not be collectible in some decades. Just wait another 4 years under Obama and you will have all the pennies you want since that will be what you will be paid with. So I found a very gently circulated 2009 log splitter penny in the cup holder from my 2009 vehicle. I truly believe that I’m one of the first people to have the penny in possession. I feel like it is an rare find so I’ve put it in a protective sleeve just in case. Could it be worth anything many years from now? I found the third penny and would like to know if it’s worth more now in 2013. I just found the second 2009 D Lincoln cent issue. To me is very special,,!!!! Regarless of it’s value!!!! We found a 2009 penny #4 in the series that appears to have been offset/double stamped on the front but not the back. Is it worth anything besides the nickel it cost to make it? Wow. I have the Young Lincoln. Whoot whoot. I have a 1946 s wheat penny with a FG stamped over 46 or vice versa.